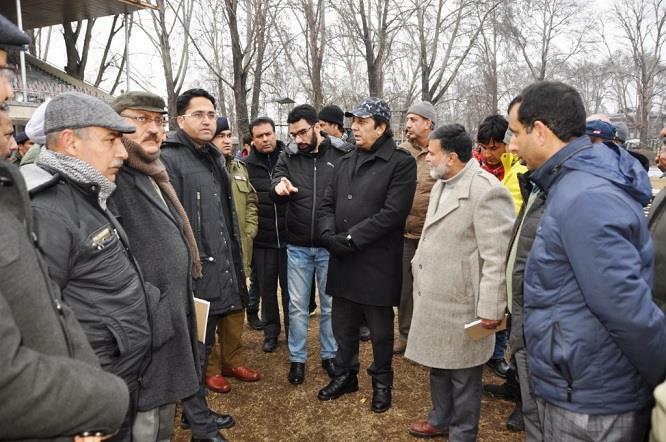 SRINAGAR, JANUARY 19: Divisional Commissioner Kashmir Baseer Ahmad Khan today visited Sher-i-Kashmir Stadium Sonwar to review the arrangements put in place for the celebrations of 70th Republic Day in the capital city. During his visit, the Div Com inspected the spot where the Chief Guest will unfurl the National Flag and take salute during the march past. He inspected the entire stadium to ensure hassle free celebrations of 26 January celebrations in the capital city. Keeping inclement weather conditions in mind, the Divisional Commissioner constituted disaster management team. The team includes officials from various government departments like Mechanical Engineering Department, SMC, Fire and Emergency, PDD, R&B, volunteers of Disaster Management. The team will visit the venue daily to perform snow clearance and other necessary measures so that any kind of inconvenience will be averted on the celebration day. The team will send a daily report to the Deputy Commissioner Srinagar’s office. To drain out stagnant water from the stadium, the Div Com directed the SMC to deploy adequate number of de-watering pumps, besides Mechanical Engineering department were asked to keep snow clearance machines ready. Fire and Emergency department were directed to deploy fire tenders near the venue. Proper seating arrangement, heating, un-interrupted electricity and water, refreshment, media gallery, adequate car parking, Public Address System, dais, innovative cultural programme, installation of CCTV cameras, illumination, mobile toilets, proper sanitation, barricading, availability of de-watering pumps and SRTC buses were other issues that were discussed during the visit. The Divisional Commissioner directed PDD and PHE for uninterrupted Power and water supply at the venue. He also directed Health department to make available medical facilities at the venue with proper staff, ambulance and Medicare facilities. Reviewing the security arrangements, the Divisional Commissioner asked for sensitization of security in and around the main venue. Khan directed officers to ensure that 70th Republic Day celebrations are colourful and full of patriotic fervor. Div Com further called for close coordination among the concerned departments for the smooth and peaceful conduct of the Republic Day celebrations at the SK Stadium. Srinagar Dr. Syed Abid Rashid Shah, DIG central A.K. Birdi, Joint Director Information Mohammad Ashraf Hakak, SSP Traffic, Commissioner SMC, Assistant Director Information Mohammad Aslam, Deputy Director Fire and Emergency Services, Director Health Services, Assistant Commissioner, ARTO Kashmir, Superintending Engineers of PDD, R&B, PHE, Police officers and other concerned officers were accompanied with the Divisional Commissioner Kashmir.